September 30th, 2015 is the DEADLINE to comment on ENDbridge’s proposed revision of line 3, the tar sands oil pipeline. Send your comments to the Minnesota Public Utilities Commission at this email address: jamie.macalister@state.mn.us. Under the subject line of your email, put in docket PL-9/PPL-15-137 and PL/CN-14-916. Below is the comment letter that I submitted on September 25th, 2015. 1. Water is more valuable than oil. At a time when other parts of this country and world are literally starving for clean water resources, here in Minnesota we live amongst over 10,000 fresh water lakes and wetlands. Many of the lakes located along the company’s proposed route for the pipeline corridor are some of the cleanest, least polluted lakes in the state. 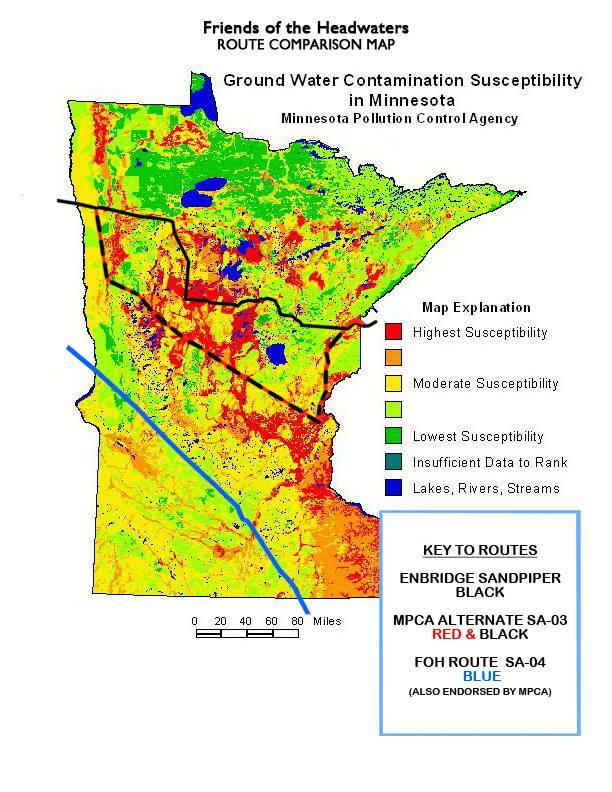 If one takes a look at a ground water map of Minnesota which shows the sensitivity of areas to contamination, it appears as if Enbridge intentionally chose a route for their pipelines through the most sensitive areas in the state. 2. Creating more pipelines only increases oil companies’ capacity for profit, which does not justify the risk posed to Minnesota’s clean water resources. The idea of creating more oil pipelines to alleviate congested railroad lines is a misconception as oil companies use these two transportation methods: rail and pipeline; to access different markets for their product. Most of the oil shipped by rail ends up on the coasts of our country, while much of the oil that would pass through this pipeline corridor would end up in Superior, WI or Chicago. Oil companies are going to ship their product to the places where they can make the most profit, so adding more pipelines will not necessarily eliminate the congested rail line problem. Since the recent decline of oil prices, if you pay attention around the state you will notice miles of parked oil train cars. It is time to slow down, take a step back and see how we can make the process of transporting oil safer for everyone, including the environment. What appears clear to me is that the explosive “trade secret” chemicals used in the fracking process should be eliminated completely or extracted before transport. Along with removing the explosive chemicals before transport, the train cars used to transport oil should have double hulls to eliminate the chance of leakage during a derailment. Any pipeline built in Minnesota should use a similar double hulled technology. Rather than over produce oil which saturates the market, we should encourage the scaling back of dirty “fossil” resources as the move is made to renewable energy options. 3. Why would oil pipelines ever be permitted to run through unaccessible wetland areas that would be nearly impossible to ever clean up? Enbridge’s stated response time to an oil spill is upwards of 60 hours. Can you imagine watching a ruptured pipeline leak oil into a river for 3 days straight? Another argument for the creating the pipeline corridor is the jobs that the project will create. Most of jobs that this project would create would be short term, so why not route the pipeline through southern Minnesota where the soil isn’t nearly as susceptible to contamination. The southerly route proposed by the Friends of the Headwaters would keep the builders of the pipeline employed longer, protect the more sensitive areas of the state from oil spills and create a route for the pipelines that would be more accessible when there is an oil leak. After the recent ruling by the Minnesota Court of Appeals requiring a full Environmental Impact Statement (EIS) on the Sandpiper pipeline, the Line 3 replacement project should have it’s own expanded environmental review to study the effects of transporting corrosive tar sands oil across the state. What a foreign corporation has proposed here is a pipeline corridor running through the heart of Minnesota’s lakes and wetlands. It is our job as custodians of the land to protect it for future generations. We must not allow the livability of our Minnesota home to be sacrificed in the name of profits for the oil industry. The oil fracking industry will leave western North Dakota an uninhabitable wasteland and if we don’t speak up and pay attention these oil pipelines could do the same to our beautiful Minnesota home.